Coastal cruising, water skiing, diving, fishing... all are possible aboard the Cap Camarat WA. 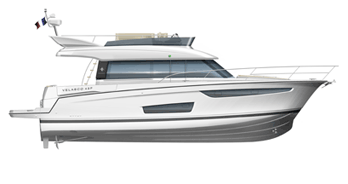 This Walk-Around line features models with stable, powerful hulls. Benefit fully from the large surface area of the sundeck and comfortable interior and exterior living spaces. A clean design style, built to last. Versatile and sporty, these family cruisers are designed to meet the diverse needs of our customers.